If you are looking for original and fun diaper cakes, this is your page. Our designs stand out for their exclusivity, at affordable prices and fully customizable. Also, if you are looking for something special, you can contact us and we will try to design a model adjusted to your needs. Without a doubt, the best gift for dads !. But how did everything begin? Several years ago, diaper cakes began to proliferate. The first cake-shaped, multi-storey, and little by little, more fun designs, depending on the imagination of each. In Flors i Detalls Casa Natalia, we started doing a few designs, but little by little, we were giving free rein to our imagination, reaching more than 20 different models that we have today, ....., and continue to innovate, Because we love it! 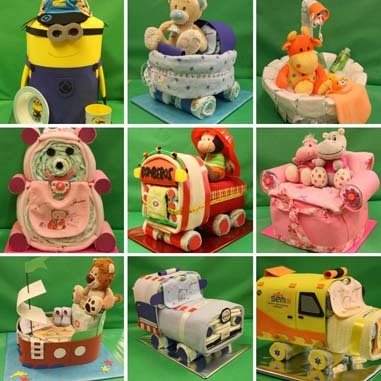 Our diaper cakes are made with a lot of love, with top quality material. We always use Dodot Stages, in all our models, without exception. We have a wide assortment of stuffed animals, blankets, and baby clothes, which we add in each model, according to its design. The details are made with rubber eva and felt. Everything done by us, in our store, with patience and dedication, and many hours of dedication. When we start a new model, we dedicate several days, to think, to try, to make templates ..., until we do not get the desired result. That's why, every creation has a special love !! In addition to diaper cakes, some thematic ones, such as our Diaciones de los Minions or Barça, we make all kinds of fun and original designs, from a fire engine, police or ambulance, to musical instruments, such as a guitar or a piano. Diaper cars, slingbacks, and a lot of animals like owls, butterflies, snails or ducks, complete our wide catalog, to suit all tastes and professions of parents. And if you do not find what you are looking for, contact us! We are always ready to create something new!